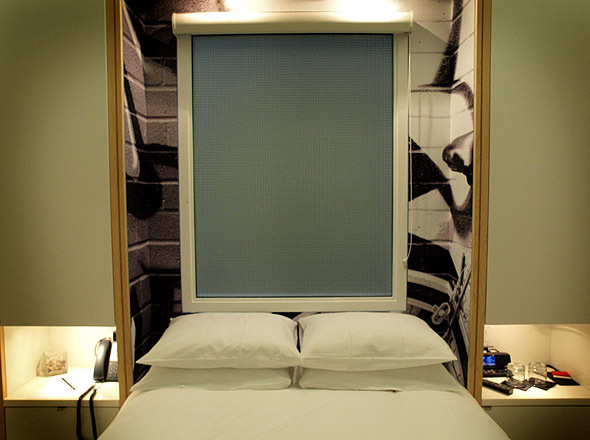 Nearly four years ago, I wrote a post on the new boutique hotels opening up downtown. There was the Thompson, then still under construction, and Charles Khabouth's Bisha, just in the planning stages. And then there was Hotel on Queen, at the intersection of Beverley and Queen West, nearly finished as far as I could tell but sitting behind a hoarding. No one answered their phone, but the architect behind the project told me that it would be open by 2010. It never did. 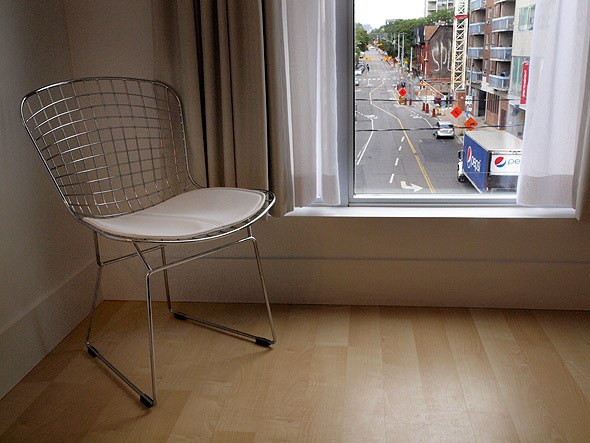 Fast forward to last week, when a hotel finally opened in the Hotel on Queen space. Now called the Beverley, it's an 18-room boutique hotel fit into a single storefront's width at the foot of Beverley. 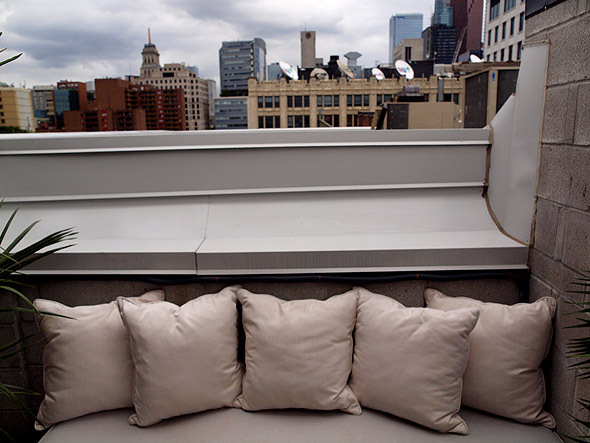 The new owners took over the Hotel on Queen space two years ago and began renovations in earnest a year ago. 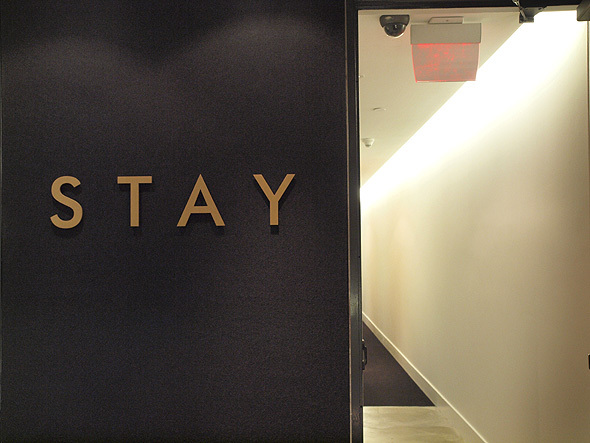 The entrance is discreet and the whole space compact, so much so that the hotel has boiled down its mission statement to three words: Eat, Drink, Stay. On the eating side there's a restaurant on the first floor helmed by chef Eric Wood, featuring a menu full of straightforward dishes like pasta, burgers, fries with aioli, steak and potato and roast chicken. 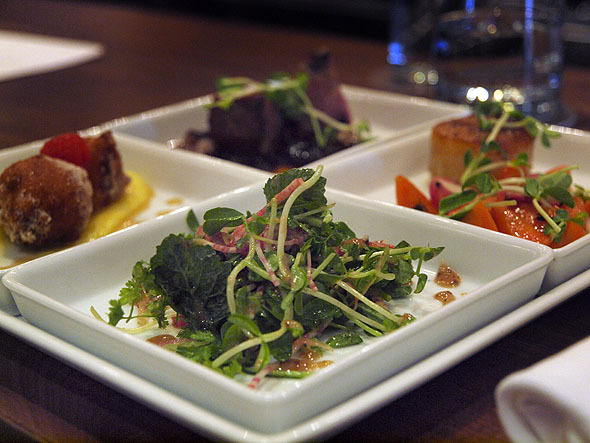 The nicest item on the menu is the 4Play platter - a quartet of samplings chosen by the chef daily, which starred a lovely portion of sous vide-cooked steak on the day I visited. 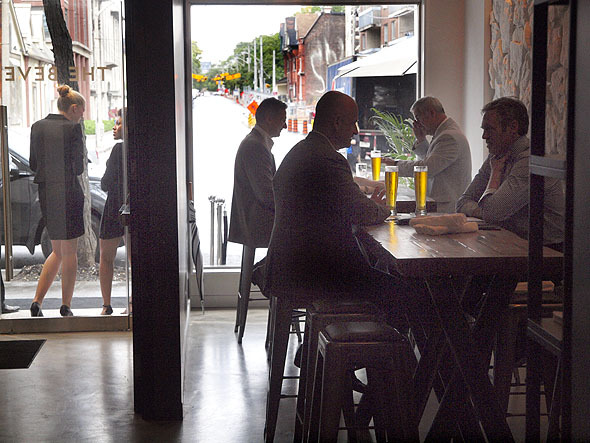 The room is divided into three areas, with tall tables up front by the street, a bar in the middle and a high-ceilinged dining room at the back. There's a rooftop bar with a limited menu and Prohibition-inspired cocktails, and plans for a speakeasy room in the basement that will hold twenty at the best, and which seems perfect for private parties. The "Stay" part of the building features three sizes of rooms just past the tiny reception area on the second floor. 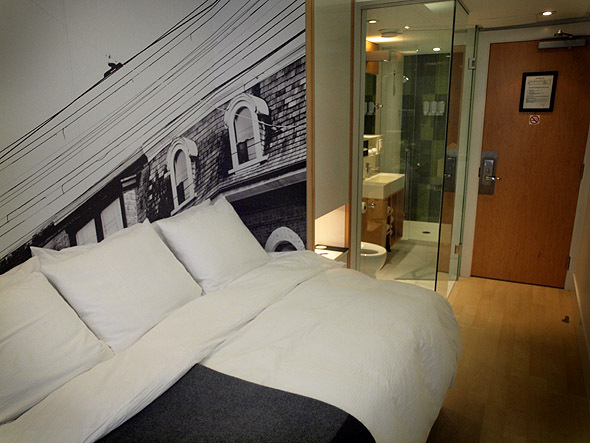 Most of the rooms are the standard size - 160 square feet for $160 a night, laid out along the centre of the building with daylight coming in from air shafts by the rooftop bar. There's a deluxe suite - 320 square feet for $200 a night with a commanding view up Beverley to the university - but the real gem is the studio at the front of the hotel, a tiny 130 square foot space at $140 a night, which has the same view up Beverley as the suite, but at the end of a tight little space where the bed sits sideways to the wall and the bathroom is tucked in next to the door. The managers tell me that they're aiming to attract a business traveler, either in fashion or finance or hopefully in entertainment, noting their proximity to the Much Music studios down the street. Whoever the Beverley's guests are, they'll have to be relaxed with whoever they're sharing their room with, since the cleverest design feature of the rooms is the extensive use of glass walls and doors around the bathrooms; even the suite has a big window between the bedroom and the bathroom, to give you a nice view of the city while you shower, and your roommate a nice view of you. There's Wi-Fi all over and TVs that descend from the ceilings, but the staff make a point of telling me that the Beverley isn't for the family market, at least in the floors of rooms between the restaurant and the rooftop bar. Though it's not hard to imagine the hotel appealing to a couple looking for a night or a weekend's escape close to the shops and shows - as long as they're not a bit shy.